Having Problems With Debt Collectors? You've come to the right place! We've helped thousands of consumers struggling with debt collectors through our free resources and information. We want to help you too. We understand that juggling bills is stressful. We also know that dealing with debts you can't pay can make that stress feel overwhelming. That's no way to live! 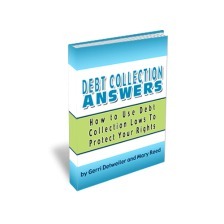 At DebtCollectionAnswers.com, our goal is help you reduce your stress and regain control of your life by giving you the information you need to understand your debt collection rights, along with your options when bill collectors contact you. We have partnered with experts that offer affordable help! Use the form below to contact them now. By the way, we may earn a small commission for some of these referrals, but we would recommend them no matter what. What collectors can and cannot do to collect from you. What to do about old collection accounts. Your options for dealing with collection accounts that are hurting your credit scores. Sued for a debt? The one thing you should not do. What to do if you think that what a collector is doing is illegal. Strategies for negotiating a settlement on a debt you can’t pay. How to decide whether filing for bankruptcy is what you should do. How to get free or low cost legal advice and assistance. We wrote our book and created this site after hearing from so many people who are struggling with debts they can't pay but don't know where to turn. Most of the people we hear from aren't trying to get out of paying what they owe; in fact, sometimes it's just the opposite. Consumers sometimes pay collectors at the expense of essential bills. Some people we hear from are worried about losing their jobs because they are getting calls about past due bills at work, while others are embarrassed that collectors have told their relatives or even their coworkers about the money they owe. We want to give these consumers - including you -information, tools and resources to resolve your debts and feel good about your financial future again. We are consumer advocates, not attorneys. Our goal is to help you find a solution that will allow you to put your debt collection problems behind you. This site provides educational information, not legal advice. I have some property of my friend's here at my home. Now I don't want to give it back because I loaned him $7000 in cash one year ago. Can I keep his property until he pays me back ?